Officials are scheduled to break ground next month on a $18 million boutique hotel in the Blue Dome District, one of the hotel's developers said Thursday. Hotel Indigo, a 106-guest-room, seven-story facility, will mark the first new construction in the proposed mixed-use development at Santa Fe Square. Jeff Hartman is part of the Hotel Indigo's ownership group, Blue Dome Hotel Center LLC, and operating partner of SJS Hospitality, which will manage the hotel. "It will be our flagship hotel," Hartman said. "It's a big project for downtown. We sold our very first hotel, Candlewood Suites, two years ago in order to have the capital build a Hotel Indigo." SJS Hospitality sold Candlewood Suites, 10008 E. 73rd St. in Tulsa, to Wood LLC for $3.525 million in May 2015. Hotel Indigo, 131 Elgin Avenue, is scheduled to feature a 1,500-square-foot meeting room, an upscale restaurant and bar with a private dining area and a state-of-the-art fitness studio. Guest rooms will have balconies that look out on ONEOK Field or on the Tulsa skyline, and patrons will have access to Santa Fe Square’s 1,100-space parking garage. Hotel Indigo will be SJS's fifth Tulsa-area hotel, including its third one downtown, joining a Courtyard by Marriott in the Atlas Life Building and a Fairfield Inn & Suites in the Brady Arts District. Greg Oliphant and David Sharp are the other partners in Blue Dome Hotel Center, Hartman said. Named for the old Santa Fe Rail Depot, which will be renovated and incorporated in the project, Santa Fe Square is a mixed-used development by Nelson Stowe, with principals Elliot Nelson and Casey Stowe. Besides the hotel, it is scheduled to include retail and office space and 291 apartments. Awesome - I am so excited for this development. That said,the national implosion in retail makes me nervous for Santa Fe Square. Well at least they plan to start on new construction within a year! I'm more bothered that the View lot still sits empty years after it was announced. What is the deal with The View? My guess is they're trying to value engineer the rents downward. Or just giving time for all these new downtown apartments to be absorbed. The Edge always strikes me as not having best site plan. You could easily fit 30-40% more apartments on that site if they had used the back half of the lot better instead of a long and low parking structure. I still think it was a great spot for Tulsa's first "Texas Donut", where the apartment building wraps all the way around an interior parking garage, providing a continuous street wall and masking the parking structure. 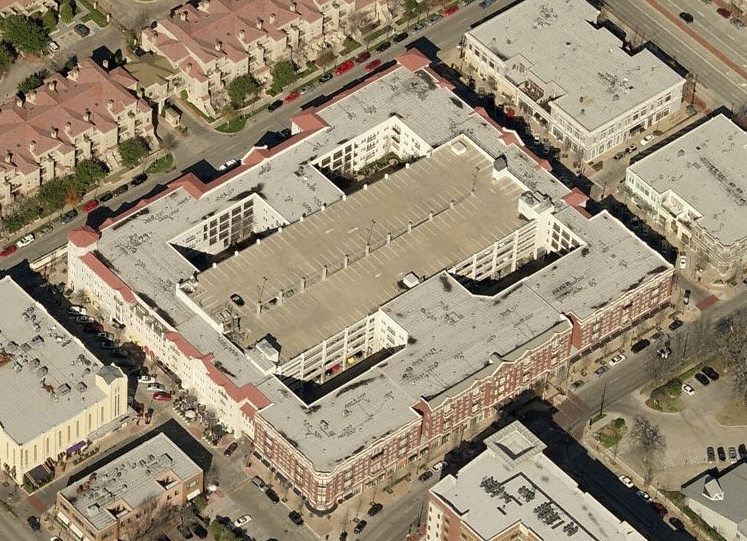 I still think it was a great spot for Tulsa's first "Texas Donut", where the apartment building wraps all the way around an interior parking garage, providing a continuous street wall and masking the parking structure. We couldn't figure out the Texas-turnaround either. Look at this lane to nowhere at 51st & Lewis. I'm sure that was supposed to be a u-turn lane that didn't go through the light. Instead, we wimped out and couldn't find it within ourselves to make 51st between Lewis and Harvard one-way and we're left with a confusing ghost lane that people accidentally drive onto. Tulsa: Taking Texas Ideas and Half-Donkeying Them. I always assumed ODOT forgot to tell the bridge designer they changed the plan and were keeping 51st two-way between Lewis and Harvard. I wonder what the construction costs were for that extra 20 feet of unnecessary/used bridge? As for Santa Fe Square, glad to see at least one phase begin. The Lewis bridge was one of the first phases in that project. It was probably too far along to change when the plans changed. The Edge always strikes me as not having best site plan. You could easily fit 30-40% more apartments on that site if they had used the back half of the lot better instead of a long and low parking structure. Yeah I've wondered the same thing, seems like a waste of space and that the added cost of a taller interior garage would've been offset by the added units created along 2nd. I guess they could do a Phase II at some point but then you would have to demo the parking structure. Who would accidentally drive onto the shoulder with that high of a curb? Looks like they did a good job with what they had to work with even if it's a bit odd. That would be stupid to make 51st 1-way for that stretch just to accommodate a u-turn. From some of the articles I saw, restaurant and retail/office space on the first floor. Hotel (the first part of the project), and apartments coming online. Parking garage for all the new tenants and visitors. $18 million for 106 rooms. I am guessing that 75% of the money was spent on the rooms and remainder on the "upscale restaurant, banquet hall and rooftop bar". That would be about $13.5 million on hotel rooms or about $127,000 per room. I am guessing the average room size is 325 square feet or about $400 per foot construction costs. The national average for hotel room construction is slightly more currently. To get $127,000 back at an average of $127 a night (total guess for easy math) you would have to rent it for 1,000 nights with no expenses. I have read that expenses for a hotel room vary from $12 a night to $75 a night on average. I will assume that $57 works (again for easy math). That leaves $70 a day to pay back construction costs. If you had 100% occupancy, the rooms would generate $7,000 a day income or $2.5 million a year. The construction costs would be paid back in a little over seven years. At two thirds capacity it would take eleven years. Rent from the other three things would generate some revenue, but not enough to offset continual updates and operations. It is supposed to be a luxury hotel so I am guessing it will be at least $140/night and perhaps have a higher percentage of luxury suites than other hotels (so maybe more $200-$400 options). Occupancy rates will be lower than that but the revenue per room should be higher. Also, there will be other revenue from renting banquet hall and rooftop bar. If they can break even in 11 years, that would still be really good as they'll then own a hotel worth millions with potentially zero debt. I do wonder how a luxury hotel will do there and how much better that will be than other hotels around. I typically prefer hotels with very nice interiors and don't care or take advantage of the "luxury" offerings. I care more about views, location and a pool/hot tub. I don't care about bellmen, room service or valet. You can get that for less than $150 most places and there's quite a few nice hotels around for under that so I am curious what will make Indigo luxurious. I looked at their Houston location (not great, but also not luxury) and the Austin one is nice but doesn't look much better than other hotels around. Prices in Austin/San Antonio are $144-$170. Some of their places have a bit of an at-home or beach home comfortable feel. Rooms look a bit more spacious than typical.